Searching online for reviews, looking at photos, and planning your journey for your next trip is half of the excitement. Preparing for your adventure ahead is what makes it so adventurous. With the destination customer journey beginning through destination-related searches, it’s vital for leisure and tourism businesses to devise and implement well-thought-out marketing strategies. With constant digital and technological advancements, it can make it tough to nail down a flawless strategy. To help springboard your destination marketing into the realm of positively influenced buyers, we’ve laid out four ways to pave the way for a solid strategy. Now we don’t mean shower users with flowery language and giveaways (although it would be nice). We’re talking about resonance: creating a powerful place brand identity that will make a long-lasting impression on your potential buyers. Your place identity should evolve from your company’s mission statement, goals, and objectives. A persona that captures the key values, culture, and commodities of your destination. Thinking of keywords that you want buyers to associate with your destination and making those words tangible. It takes more than well-thought-out descriptive words that sound lovely. It’s about making these words a part of your destination. That will resonate with your potential buyers, and will ultimately influence how they feel about you, thereby deciding their buying behaviour. Once you’ve established your strong identity, it’s time to think about interacting with your buyers. Modern-day consumers’ behaviour has seen a shift from the buzzword of ‘engagement’ to ‘interaction’. Long gone are the days where measuring your number of followers or likes is seen as a success: it’s now all about what your buyers are actually doing with your brand. Rather than waiting for your potential buyers to come to you, why not go to them? Don’t all rush off at once. We’re not saying send hundreds of emails, constantly tweet, or tag target customers on Facebook – don’t do any of those things. Think more guerilla and direct, with in-market events. The destination, travel, and leisure industry is often dubbed “the invisible industry”, and now it’s time to show you’re here. Take elements of your destination that encapsulate your place identity, and allowing potential buyers to get a real taste of your destination, as opposed to relying on online reviews. Experiencing first-hand what your destination has to offer will directly influence the buying journey for your destination. But remember to showcase your in-market events online, because there’s always a chance your footage may go viral. It’s like the old saying: less is more. Would you rather have an abundance of content that hardly brings in any value, or a handful of pieces that have true substance and which generate a lot more value? We’re guessing you’d choose the latter option. There’s no point in having lots of content if it’s not purposeful and is only there to fill pages on your site. It has no value, no meaning, and no influence on your potential buyers. So let’s focus on creating content with substance. The best way to hold influence over your buyers is by utilising the trend of influencers – that is, influential bloggers and content-creators. Contacting local or national online influencers to visit your destination is a great way to indirectly influence your potential buyers. Using techniques such as influencer takeovers across social media platforms not only pushes your destination further online, but it does so from the position of someone actually experiencing your destination. Unless you’ve been living under a rock, it’s clear that video is now a vital content format for all types of companies. Sprawled across every possible outlet is the medium of video content. Usually we’re not one for advocating to follow the crowd, but in this instance we think you should. Whether you use POV with a GoPro, go live online, or use snippets in your social stories, the video format provides you with rich content that will certainly hold influence over buying decisions. We’re not saying the written word is dead, because it certainly isn’t, especially in the destination industry. By producing written guides and travel blogs on your destination(s), you’ll showcase the different elements to your brand, and that will resonate with potential buyers. Using the process of outreach to place your travel blogs on relevant destination sites for different cities can prove extremely vital when influencing buyers. Using these key methods, you can really make your content stand out. When creating content, it is important to understand that you make an impression during each stage of the buying journey. Whether it’s video blogs, influencer travel diaries, or live streams of your destination, content is the biggest way to influence your future customers. The latest digital trend taking brands by storm is the notion of VR (virtual reality). Taking users on simulated adventures, VR immerses the consumer in a digital environment where they can experience the real world in 3D. This goes hand-in-hand with destination marketing due to its attributes, allowing users to experience a destination or place without having to actually be there. This can significantly influence the buying journey, as it allows consumers the opportunity to ‘try before they buy’. Going that extra step further over video content, VR allows buyers to become participants rather than just viewers of the content. They get the chance to become immersed and fully involved in the destination marketing adventure. The VR format also offers the chance to personalise adventures, tapping into direct target audiences, and influencing buyers on a personal one-to-one basis. VR is known as the technique to inspire imagination, and it’s time for destination marketers to be inspired. Creating VR content and gathering VR footage isn’t just for the Goliaths of marketing – the Davids of the industry can generate their own VR campaigns too. Many services do not offer round-the-clock customer services, and this is exactly where destination marketers should step ahead. When we search for trips or places to go, it is more often than not done outside of office hours, so it’s highly likely that this is the same for your potential buyers. With this in mind, offering constant availability can positively influence your user. If you’re thinking of how to always be available and online for your potential customers, then look no further than chatbots within messenger apps. Utilising the idea of a chatbot will help your destination marketing by providing a personalised journey map for your potential buyer. Whether they want to know the location of your destination or the price of it, chatbots allow 24/7 service to your consumers. By taking advantage of this ‘wherever, whenever’ style of service, it provides high influence on the buying journey, because your potential buyers will have constant access to advice and information in booking their place to come visit your destination(s). The buyer’s journey within destination marketing is like no other industry. It shifts from search, to reading blogs, to even craving user-generated content. 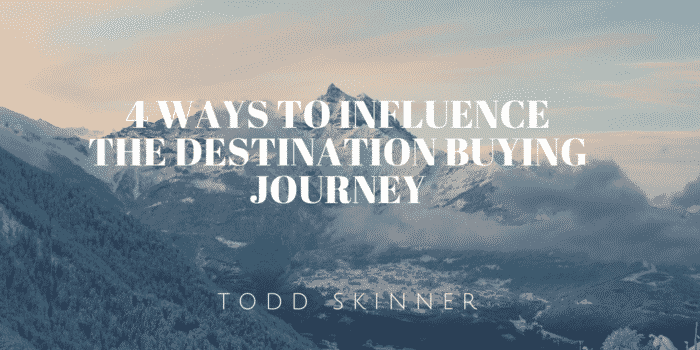 This is why it is important to ensure that your destination is a positive online influencer to ensure potential buyers are swayed to your destination and not to your competitors’. If you want free consultation on how to put a strategy together, feel free to contact the team at theEword.